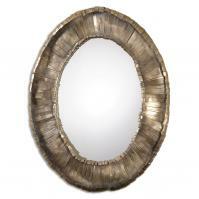 Add a touch of elegance and whimsy to your bedroom with this sophisticated Dorgali mirror. 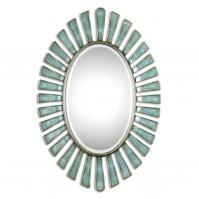 The mirror is framed in metal that is finished in an aged slate blue. 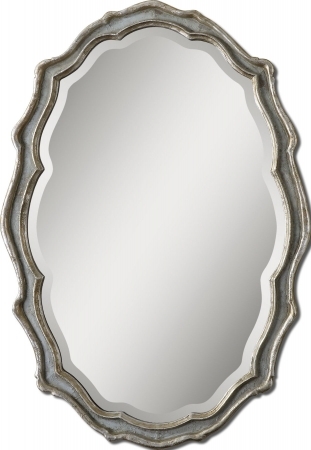 Silver leaf details provide a rich tone for this mirror and the 28 inch by 40 inch measurements make it perfect for functional use. Imagine hanging this piece over a bedroom desk, dressing table or chest of drawers. 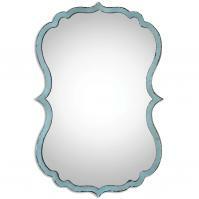 You could also use this in the bathroom or living spaces. Regardless of whether you hang this mirror for functional or style reasons, we are certain that you will be happy with its long lasting quality. Product arrived in perfect shape, very well packaged, and was VERY nice. Unfortunately, the amount of blue in the frame was very light. As much as liked the mirror, this was a disappointment as it did seem to be described as being more blue than silver.